In a few days time Miss Tiggy will set sail on the Oyster Round World Rally. Our Crew is now complete – Michael Roberts rejoined us from Melbourne complete with coffee pods for our Nespresso machine, 4 tubes of vegemite and most importantly, the Maddie Riewoldt Vision (MRV) flag that is now flying proudly with our Aussie one to lead us home across the Pacific. The addition to the team is Charlie Vinten, a young Brit who we met originally in Palma and has been a skipper on another Oyster 575 for the past 7 months. Gone is my amazing friend and chef across the Atlantic, Michelle Elia, which leaves me as chief of the galley with the main responsibility of feeding 3 hungry men! “Come back” Mich I say!! If the world was populated with the people of Antigua what a different place it would be. Hospitable, relaxed, friendly, amusing, happy are just a few adjectives to describe these Carribean characters. Our recent visit to a plumbing and hardware store perfectly demonstrated to us what it is to be Antiguan. We witnessed, while in a long line to check out with our goods (due to their antiquated accounting system) their way of verbalising dissastisfaction at having to wait. There was no abuse or complaining but merely a comment made by one man to the girl behind the counter saying that his legs were very tired. Rather than ignore him she replied that she would be happy to lift him and take the weight off his feet. The banter was gentle and fun, so different from big city queues and stressed out shoppers! 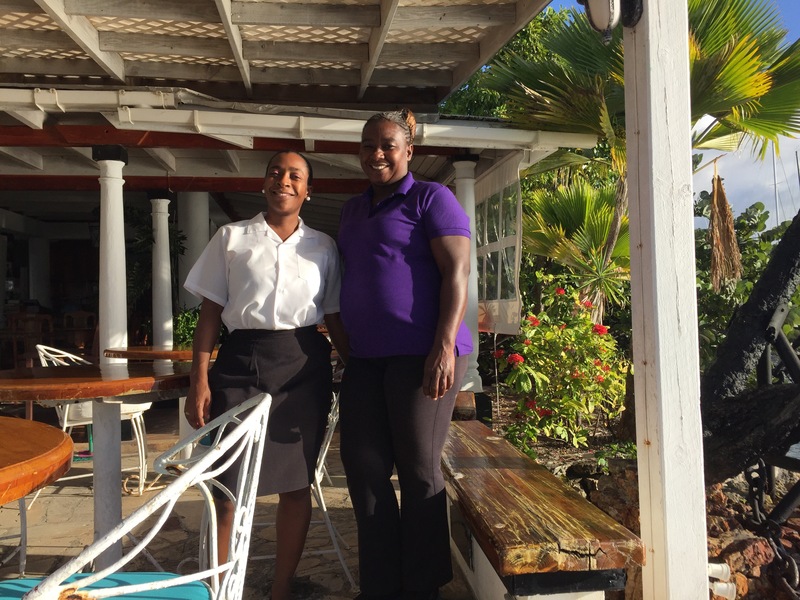 Two of my favourites are below – Sheena who made me a delicious cappuccino most mornings that we were in Catamaran Marina and Beverley who did our laundry on a regular basis…everything was always executed with a smile! In two days time James and I will have our Padi Open Water Diving licenses. Mind blowing is how I would describe my first experience of breathing under water! Why have I never done this before I ask?? Our Diving Instructor, Shawn, has taken us through a series of diving competencies and even though some of them were not that pleasant (e.g filling up the face mask with sea water at 10 metres of depth and then clearing it ) but the experience of being at neutral bouyancy and moving through the the water while breathing and looking at the spectacular coloured marine life has opened up a whole new world! I have changed! I would never have described myself as stoic before this adventure but I have quickly learned that there are times when you just have to put up with being wet and uncomfortable or be able to assist with the needs of the yacht or crew, when all you want to do is sit quietly in a corner of the boat. If something broke at home, I would pick up the phone and get help – I now look at the problem and try to solve it myself, even to the point of hanging upside down in the bilge and clearing the blocked drain from the washing machine. Not much fluffing and coiffing and makeup is going on and shorts are now the mainstay of my wardrobe. Above and beyond that I have learnt the true meaning of “obey” (which I deleted from our wedding ceremony) because on a boat there is only one skipper and that is James! Last evening Oyster Yachts put on a dinner to farewell the fleet – the first of many social events and rum punches! There is a great deal of anticipation in the air as the culmination of months of planning and organising is coming to a head – the general feeling is “let’s get the show on the road” ! At 1300 on Sunday 15th of January, 30+ Oysters will sail out of English Harbour in Antigua on the first leg to New Zealand!